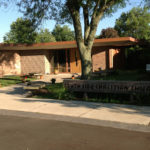 Southside Christian Church, an Open & Affirming Congregation in South Bend, Indiana. I was surprised last week, pleasantly surprised. I can only now express to anyone else what happened to me. I had a vision! Yes, believe it or not I had a vision. I thought visions were for people of a thousand years ago who did not know how to express themselves, but just last week I had a vision and was removed from my office for just a few minutes, but it seemed like hours. Read this and believe it or not. While at my desk reading Search and Call forms, it suddenly felt like I was lifted up and put on the front steps of a golden colored sandstone church. It was familiar to me but I could not place it exactly. As I looked up at the front doors of the church, I saw the doors were huge and took up the whole front of the church. I couldn’t believe what I was seeing. (Did I tell you I was really surprised by this?) Where were the hinges these doors hung on? How could these doors, closed as they were, take up the whole front of the church? Suddenly, with a creaking sound, these huge dark wooden doors, began to move, slowly they were opening. I could hear gears clinking together and hinges screeching like they did not work very often. The doors opened just a few inches and I saw people behind me going forward and turning sideways, stuffed themselves into the church. Not many got into church and there were great masses standing with me still, far more than entered the church were still on the outside. Once in a while a person would appear at the crack in the door shaking their head, somehow judging those who were still on the outside. Softly, I started hearing those standing with me saying “Open the Doors”, “Open the Doors”. Each time those three words were said, the next three were louder, then louder, then louder…”Open the Doors”…”Open the Doors”… But instead of opening farther the doors of the church creaked closer together till there was only a dark crack between the doors through which no light shined. Then the biggest surprise of all happened. I heard a great high pitched voice speak to all :”These are my children with whom I am well pleased.” After those words, silence hung above the crowd. Something special, holy even, had happened and no one knew what to do about it. Then great noises like explosions were heard. I had to put my hands on my ears from the cacophony. Great gears were meshing, hinges were screaming , groans were heard from inside the church and the doors, the whole front of the church began to open, slowly, slowly. The light of the sun shined into the church revealing a great round table just inside the doors with bread and a large roughly hewn cup on it. Applause broke out, the crowd was joyous, people were dancing. Men and women of all different races, skin color, sexual orientation, were holding hands, hugging, for they knew something special happened in front of them. I haven’t seen this at a church ever. Like one body, the crowd began to move forward till the table was engulfed by the group. Someone reached forward picked up the bread, broke it into many pieces and passed it around and as it was passed it seemed to feed all, everyone tore off a chunk, some even sunk their teeth right into the loaf. Then a great chalice was lifted and passed around, and as it passed from hand to hand more cups, glasses and chalices appeared so all could drink of the holy contents. As people ate and drank they seemed to grow in stature, in strength, with energy. Then in the great light a great voice was heard again “Tell all what happened here.” And while I was feeling greatly satisfied, my eyes were opened to where I was. I was brought back to my chair, my desk, my computer. I remained with a great feeling knowing God had given me a special vision for what God wanted now. I just had to share this great experience with you.